On 31 August 1844, an advertisement in the Warwick and Warwickshire Advertiser announced that, during the following week at the Bowling Green, Warwick “Master Augustus Gyngell, only eight years of age, the child with the iron nerve, will make his daring and astonishing flight across the Green, from an immense altitude, surrounded with fireworks, as the Spirit Ariel, travelling at the rate of 200 miles an hour”. We’ve not found a report which might have verified the height or the speed of the flight, but this brave young man survived the ordeal devised for him by his father “Professor” Gyngell, the pyrotechnist, because just four months later he was at the Northampton Theatre, flying from the back of the gallery to the stage “through a chromatic fire cloud and shower of fire”. So, what relevance does this have to our local area? While Augustus’ father, uncle and other relatives continued as firework display organisers, tightrope walkers, etc., Augustus (better known as George) had become a photographer by the mid-1860s. Our interest is that, for a time, he worked in Somerset, and he is one of the photographers whose lives have been documented in a new book just published by the Society Secure the shadow: Somerset photographers, 1839-1939. This is a celebration of Somerset’s photographic history, as seen through the lives of its photographers. The main part of the book includes a listing of nearly 800 photographers, who worked in Somerset over that period. The dates and locations of local studios, included in the directory, will, we think, be useful information for dating photographs. A disk accompanies the book, and this includes biographies of each of the photographers, based on census information, about 3,000 newspaper articles, books, archive material, and many other sources, as well as selections of the photographs they took (more than 1,500) – ambrotypes, stereo views, cartes de visite, cabinet cards, tintypes, postcards etc. The aim of the life stories of the photographers is to describe whole lives, and so their careers outside Somerset are covered in addition to time spent in the county. As a result, the book has relevance for Dorset as well as Somerset: Gyngell worked in Dorchester, as well as in Castle Cary; the flamboyant and tragic Theodore Brunell worked briefly in Bath, but for a longer period in Dorchester and Weymouth, Henry and Jonas Walter worked in Yeovil and then Lyme Regis. The well-known Adam Gosney of Sherborne had studios in Yeovil, Wells, and Crewkerne, and visited many Somerset and Dorset villages with a mobile studio. A studio photograph of Ben and Marie Crossman taken about 1897. Many of the images are portraits and, in some cases, the sitter is named. This led to the authors realising that one author (Allan) had, several years ago, collected a photograph of a relative of another author (Phil). 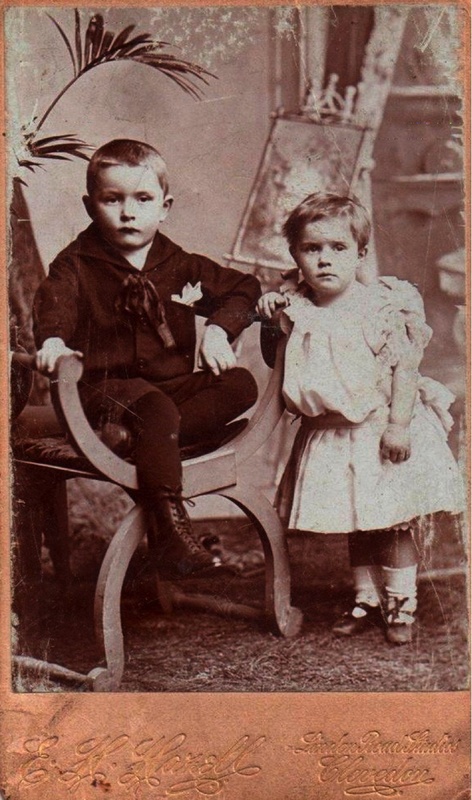 The image is a carte de visite taken in about 1897 by Edwin Hazell at his studio in Clevedon and the names “Ben & Marie Crossman” were handwritten on the reverse. Generally, our research was focused on the photographer rather than the sitter, but in this case, Phil decided to check on the sitters. To his surprise, he realised that the girl in the photograph went on to marry his mother’s cousin – and as a boy Phil had stayed in their farmhouse. The book has been more than eight years in the making, building on a more extended period of research on Somerset photographers by one of the authors. Copies are now available for purchase for £12.00 via our online shop (where prices include postage) and also direct (in person or by post) from the SDFHS bookshop at our Family History Centre in Yeovil. 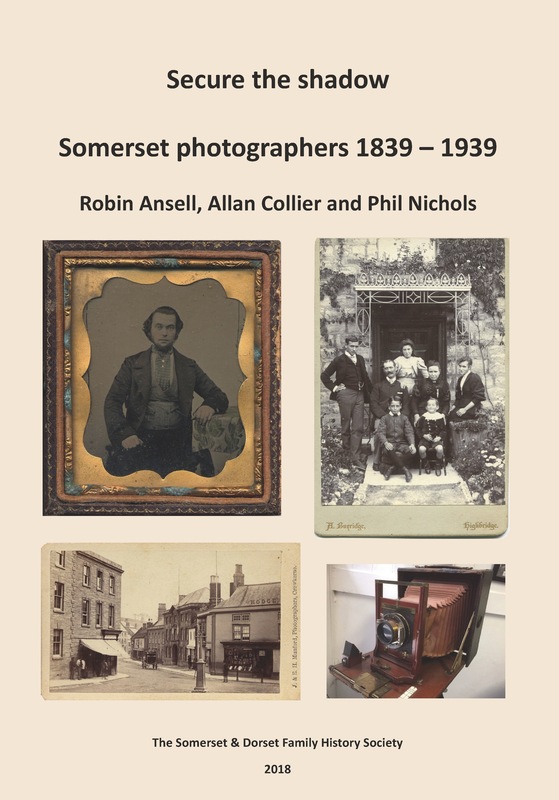 We welcome contact from local groups of the Society with requests for talks on Somerset’s photographic history – the talks will be locally themed, and well-illustrated. This entry was posted in Uncategorized and tagged Adam Gosney, Allan Collier, Ambrotype, Augustus Gyngell, Bath, Cabinet card, Carte de visite, Castle Cary, Crewkerne, Crossman, Dorchester, Dorset, Henry and Jonas Walter, Phil Nichols, Photography, Robin Ansell, Sherborne, Somerset, stereo views, Theodore Brunell, tintypes, Wells, Weymouth. Bookmark the permalink. At last and well worth waiting for – well done Robin, Allan and Phil.